Search Engine Optimizations having numerous tactics, among of them one of the most powerful way to promote a particular post or many posts, those you want to promote, then anchor text is the most powerful way to promote, it's free and effective for promoting, may be this information is new for you, then let me tell you, use this in your blog to increase ranking as well as reputations of your blog. For example most of the top directory websites using this tactics but remember don't provide no follow links to your own blog post, which will not helpful for your blog for getting very good rank in the search engine. It would be work in negative side. Even professional bloggers do mistakes for SEO, every one don't know about this but this blog post will unveil every thing for you, that's why you can get better rank of your blog posts on the search engine, ultimately you will get better traffic to your blog. I will tell you this tip to use in your blog post in different ways in your blog posts, that's why you will get your target readers quite easily. Now may be you wanted to know. An anchor text means, the text contain links, like I have provided to promote my blog posts, but remember do not provide no follow links to your own blog posts it will not help you to achieve your goal always provide do-follow links to your own blog posts. Here is the main thing for you provide link to your own blog posts for important keywords on your blog post, this will not only increase your blog views also decrease bounce rate and your blog rank will increase day by day. But, here is the mistake you are going to make, you must not provide link to the blog post for the same keywords, provide links to the post but with little variations on your keywords that is good for getting benefit of using anchor text. Other wise, search engines will understand that there are definitely some problems, if you will provide many links to the same blog post with same keywords, so always provide link to the blog post but with little variation in the keywords. One more thing, I would like to share with you always provide open in new window button for the anchor text to get more benefit of using it, but I will suggest you to provide quality contents and then use anchor text that's why people will trust your blog, remember in business trust is everything, you and me both know blogging is a perfect business, if you can do blogging then blogging is the best way to enjoy your life. I think you got about this anchor text for getting benefit from search engines, actually I have not clear about it, here is that. How It Will Rank on Search Engine? When any people will search on search engine, blog posts will show on the top of search engines, actually when many blog posts will link to the same post then search engine will understand the category on the blog post as well as blog post content type. Your blog post will show on the top, when people will do search on the same keywords. How to Do Variations in Your Anchor Text? Well, for this you need to understand about Keyword Research, actually I know it is little bit difficult to understand the proper way to use keyword research as a newbie, there are many tools to do keyword research but I will recommend you to use Google Keyword Planner. Here is the detail guide to Google Keyword Planner. See, if you will learn Keyword research then you will see there are different volume of searches for particular keywords with same root keywords. Then, here is the main concept to implement while putting anchor text, just put different different keywords with same root pf keywords and then link to the blog post, which blog post you want to target. Again, do not put too much keywords, don't even add more than one link to same blog post of your blog. Just implement this tips every day, when you write blog post. 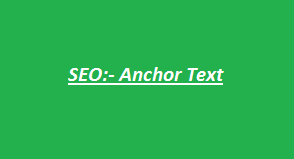 Don't try to use different post links for particular keyword which post is not related to your anchor text, always provide links to your blog post, which link is related to anchor text. If you will use different colors for anchor text then it will convert well, that's why your blog page views will increase. I know, it is useful but you must follow it proper way, otherwise it will not work well. Is there anything you want to know about Anchor Text?